This story begins with the first person to have seen a surprising optical phenomenon on the Marfa plain — Robert Reed Ellison. It was March 26th of 1883. He and his cattle had bedded down for the night on the Marfa plain somewhere between Antelope Springs and Paisano Pass. (Paisano Pass skirts around Paisano Peak, and Antelope Springs is just above the letter M in the label, Marfa plain, on the map.) A little after moonrise, 16-year-old Ellison observed that the mountains looked like they had just moved up a little closer to him. We know he made that observation because he included it in his memoir, written in 1937. True. But, what is the appearance of mountains except a large collection of lights that propagate through the air to the observer’s eyes? The lights in this case were rays of moonlight reflected from the rocks, soil, and vegetation on the surface of the mountains. What Ellison’s memoir doesn’t tell us is the origin of the currently popular tale about him having seen a light in the distance that he suspected might be the campfire of Indians. This tale is repeated everywhere on the Internet. But, he didn’t write it down. Ellison’s family members say he passed the tale on to them verbally. What I remember is there were lights down there they couldn't explain. They thought they were Indian fires. They were just there all the time, part of the country. At least that's what I remember him saying. I've been through this [Ellison’s 1937 memoir] twice and couldn't find anything about the lights. I kept thinking I'd find a sentence or something about it. Ellison's recording in his memoir is about a real event (cattle drive) and the sighting of a mysterious light phenomenon (mountains coming nearer). The story was written down by the observer himself. This provenance is about as good as it gets for something that happened 130 years ago. 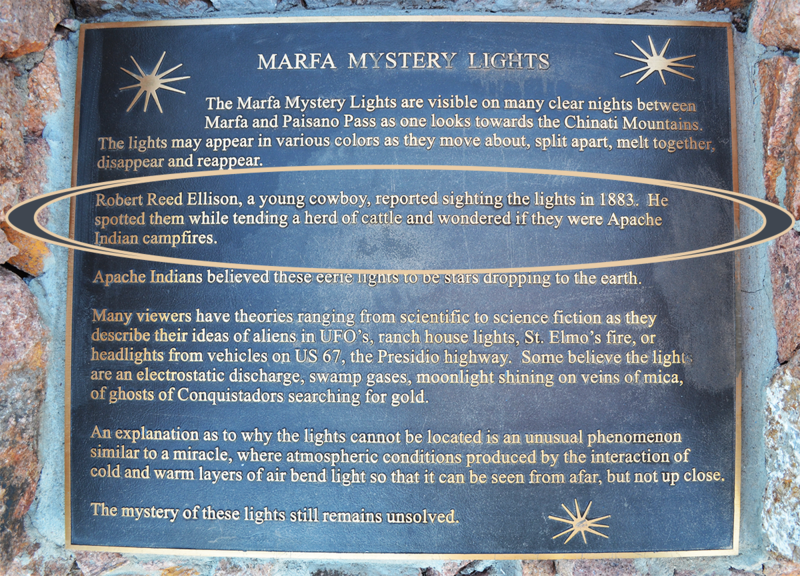 The next written part of the Marfa lights history traces its origin to around 1901-1902. Judge O.W. Williams was surveying land in the Big Bend region of Texas and heard stories about the ghost of the great Apache Chief, Alsate, from one of his Mexican assistants, Natividad Lujan. The Judge took notes about this, and other stories, told by Natividad. Later, he developed them into fuller narratives. Williams published a pamphlet  containing the Alsate tragedy around 1920. In 1944, he published another variation of the Alsate ghost story in Frontier Times. In these articles, Williams recounted the saga of how Alsate was killed by Mexicans in Ojinaga, Mexico in 1882. (Ojinaga is across the Rio Grande from present day Presidio, Texas as shown on the map). Following Alsate’s death, his ghost was seen at night by people in the Big Bend region of Texas. This “ghost” story may have been what led to labeling mysterious lights that were seen by later generations, as ghost lights. The Alsate tragedy is a hybrid mysterious light story. It relates the actual entrapment of Alsate and his people. And, his execution is also an actual event. But the light seen by people that is attributed to a visible apparition of Alsate’s ghost has to be a myth. Our next episode about the mysterious lights of Marfa is the first in the modern collection of sightings. The lights were really there. They were seen by multiple observers. And, the story was told first-hand by the observer, Hallie Stillwell. We decided to come to Marfa to attend to a little business. We were just visiting and talking and all of a sudden we saw lights over on the Chinati Mountains. It couldn’t be any kind of car lights, and uh, we first thought it probably was a campfire of Indians, or Mexicans, or ranchers. But, it didn’t act anything like a campfire at all. They were peculiar, and I’d never seen anything like them before. And, of course, none of us knew anything about it. We were not scientists or anything like that. So we said, “Well, it couldn’t be anything but a ghost. It’s just ghost lights.” And from then on, we mentioned them as ghost lights. While Hallie didn’t write anything about the sighting at the time of the event, when her story was told on “Unsolved Mysteries” in 1989, it was not an actress who recounted Hallie’s experiences. It was Hallie Stillwell herself who told of seeing ghost lights. There can be no doubt regarding the authenticity of the account. Also note that in Hallie’s narrative, we find the first definitive basis for calling first-hand sightings of real lights — not mythological ones — ghost lights. Ruth Bownds Kershner is the source of some of the best documented first-hand sightings of Marfa lights that the authors have found. Born in Marfa in 1914, she lived there until 1932. In 1999, she recounted two separate stories about the Marfa lights as part of a larger essay entitled, “Marfa Stories”. Both stories took place between 1928 and 1932, while Ruth was in high school. In one, Ruth told of attending dances at a barn just south of Marfa. She indicated that at those events, she saw the Marfa lights off toward the east every evening. In another story, Ruth recalled that after seeing a movie on Friday or Saturday nights, the teenagers would drive out east of Marfa and park along the old Marfa–Alpine Road close to the current MLVC (map #6). There, she saw the classic Marfa lights. We use the word, classic, in this history and in our book  to describe the lights seen toward the southwest in the direction of the Chinati Mountains (map) because these are the most famous lights, and the ones most commonly seen — the ones for which the MLVC was built. In both of Ruth’s stories, she recalled that the lights appeared like long streaks. And, she indicated that they were readily repeatable. As we indicated above, 1944 marked the publication in Frontier Times  of Judge O.W. Williams’ essay on the tragedy of Alsate, the great Apache Indian Chief. We make note of its publication here in the appropriate chronological position to highlight another point. The Frontier Times article was the first nation-wide publication of a ghost lights story from the Big Bend of Texas. In February of 1945, another publication from outside the Big Bend region carried the story, “Ghost Light Appears in Marfa Area”. This article in the San Angelo Standard–Times was generally like the story told by Hallie Stillwell, with one addition. This story added that in 1944 someone from the Marfa Army Air Field (MAAF) had taken to the air at night to try to locate the mysterious lights. There was no doubt that lights appeared somewhere off in the direction of the Chinati Mountains. But, no one had yet found them, and two Army airmen were on their way to solve the mystery. What they found is that from the air they couldn’t see the lights although the lights were clearly visible to viewers on the ground. So the airmen failed in their effort, and the mystery remained unexplained. It seems that Kahl was the airman in the San Angelo Standard—Time’s article. It’s too bad that no one had an “ah-ha” moment and realized that lights being visible from the ground, but not from the air, provides a clue to the character of the lights being observed. The story of an Apache ghost appears again in the July 1957 issue of Coronet Magazine. In the one-page article, “The Mystery of the Texas Ghost Light”, the term ghost light is used to describe a mysterious light that “gleams out of the night like a weird cyclopean eye”. They say it can be seen at night from the stretch of US67/90 between Alpine and Marfa when a person is looking in the direction of the Chinati Mountains to the southwest more than 50 miles (actually 42 miles) in the distance. (See map.) This account also states that the light originates from the Chinati Mountains. Like so many other articles, it then lists a collection of possible explanations, concluding each with a skeptical remark. Part II continues the history and brings it up to today.